The first trains in Australia were built when the vast country was little more than settled colonies spread far and wide across the land. Up until the mid-1800s, horse-drawn carts and coastal shipping services were the main modes of transport, however all that changed in 1854 when the first steam railways was built. Operating along a route between Melbourne and Port Melbourne, this single steam rail began a locomotive revolution which saw various colonies rapidly develop their own rain systems. By Federation in 1901, all Australian states except Western Australia were linked by over 20,000km of railway tracks. Although rail networks continued to expand, no plans had been made for a national network, which meant a number of different gauges had been used. This meant that should a passenger which to travel by train from Perth to Brisbane on an east-west crossing, they would be required to change trains a total of six times. World War II made it clear just how incompatible each state’s rain systems were, as moving large quantities of goods and personnel across the country in a timely manner was very difficult. This began Australia’s effort to unify its rail systems. Although this effort began in the 1930s, it wasn’t until mid-1995 that a standard gauge track had finally been established. Making it easy for passengers to travel almost anywhere, these standardised tracks meant passengers could travel between Brisbane, Perth, Sydney, Melbourne or Adelaide with ease. However by 1970, rail travel has improved so dramatically that not only could passengers travel on standard gauge tracks for the majority of their journey, it also meant that many could remain on the same train depending on where they were travelling. Although there are still three different types of gauges used across the country, all Australian state capitals are linked by a single uniform gauge. The first trains in Australia were steam locomotives which were used up until the 1950s when they were replaced by a phasing in of diesel-electric locomotives. By the 1970s, as single gauge rail was taking over, steam locomotives were completely phased out. These days, while the railways are still used to transport goods, Australians enjoy a love affair with train travel. Travelling by train, you're free to soak up the atmosphere and take in the sights or this vast country of ours. 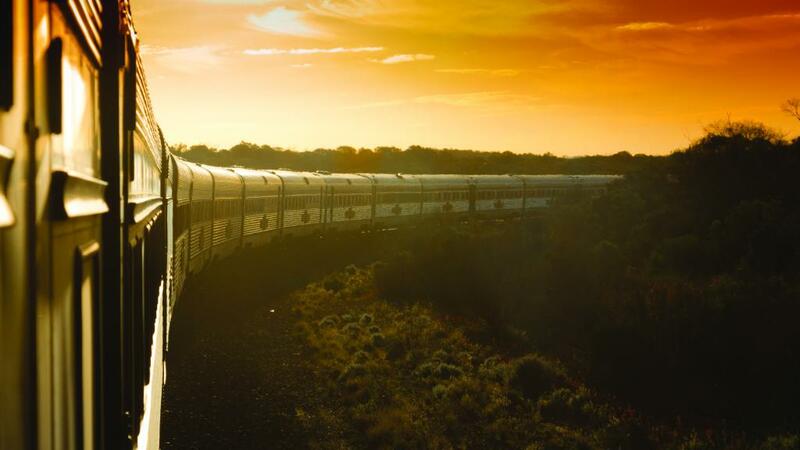 From the famous Ghan to the iconic Indian Pacific and the scenic Spirit of the Outback, a journey on Australian’s trains takes in breathtaking, changing landscapes that range from red dirt to lush rainforests, mountainous rural countryside and stunning coastal views.